Kim's Husker Highlights - Huskers Etc. I won Husker tickets to the Nebraska vs. Colorado football in Lincoln, but ended up selling them on eBay as I made prior commitments. And I obviously missed a great game as we came back and won 40-31! Nicer weather and a more exciting game than the NU vs CO game I went to last year! So now the Huskers are going to Jacksonville, Florida to play Clemson in 2009 Konica Minolta Gator Bowl on New Year’s Day. I have friends that live in Florence, South Carolina, that are driving down to the game and invite fellow Nebraskans to tail-gate with them! Speaking of Nebraska football, high school is just as popular around here! So you can imagine how excited my town of Pierce was to win it’s Back-to-Back Nebraska Class C-1 State Football Championship! My son was a senior on the team, so it was even more exciting for me! Today on Who Wants to be a Millionaire, the question was (I’m paraphasing) “What is the University stadium that becomes it’s state’s third-largest city on game days?” Of course, we all know it’s Memorial Stadium in Lincoln, Nebraska. And below is a picture of my son’s Husker theme room. Our house was on the Tour of Homes, and I have reason to believe my house may not be this clean or decorated again for awhile, so I took a ton of pics (click for more). 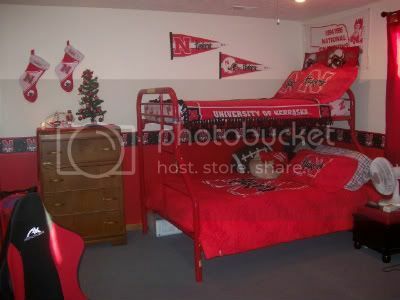 Decorate a Husker room like Taylor’s with Husker Bedding and Husker Christmas Decorations. Nebraska Cornhusker Tickets for Sale?